This sweet crochet baby dinosaur toy in blue is suitable from birth and machine washable. With its gentle rattle sound and stimulating crochet texture, this Dippi dino makes an ideal first dinosaur toy. Newborn Xmas gifts don't get much cuter than this! Handmade from 100% cotton yarn by a fair trade organisation. Best Years are a soft toy manufacturer based in the UK. 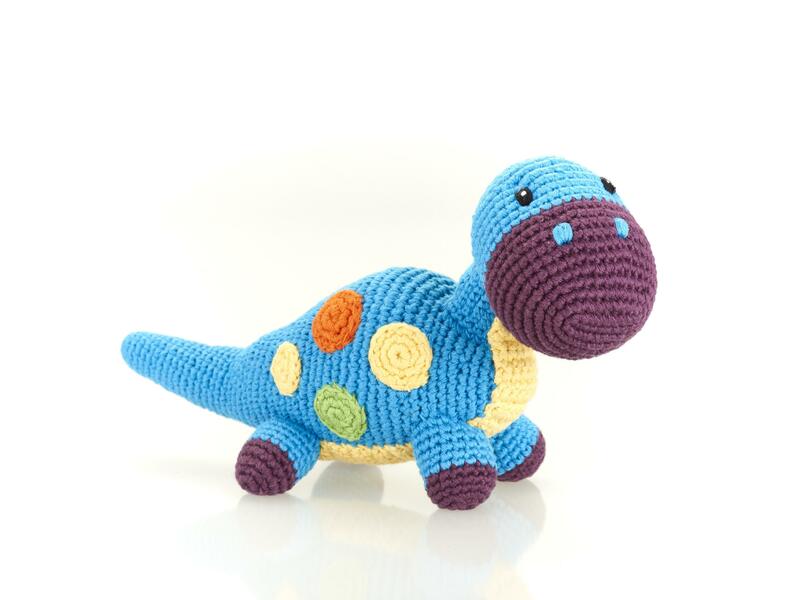 All our crochet fair trade dinosaur baby rattles are available to consumer, wholesale, retail and museum customers. Pebble toys are the only knitted and crochet toys guaranteed by the World Fair Trade Organisation to be fair trade. When you buy a Pebble toy you can know that your purchase is helping to give people a chance of a better life. Thank you for your support. To read more about Pebble toys please click here.